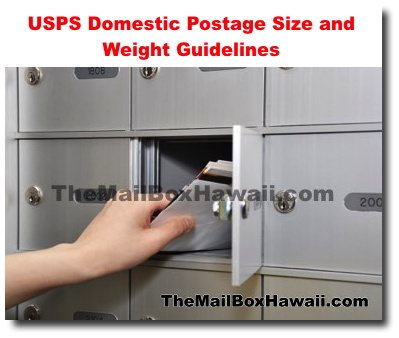 Before you drop your mail or postcard off at the mailbox or local post office, check out our simple size and weight guide for United States Postal Service mailings. 1. Envelopes - Envelopes must be rectangular in size to qualify for letter prices. 2. Large Envelopes - large envelopes must not exceed the noted size below or they will be charged package prices. 3. Postcards - Postcards must also be rectangular in size to qualify for First-Class Mail prices. Oversized postcard will be charged as either a letter or large envelope depending on its size. For more shipping and mailing tips, visit our Mailbox Tips page.